The more Tony Fiorillo explores Alaska, the more dinosaur tracks he finds on its lonely ridgetops. The latest examples are the stone footprints of two different dinosaurs near the tiny settlement of Chisana in the Wrangell Mountains. Fiorillo, a dinosaur hunter with the Museum of Nature and Science in Dallas, recently wrote of the foot impressions of a large plant-eater and small meat-eater in the science journal Cretaceous Research. Fiorillo is a yearly summer visitor to Alaska who seems to discover something exciting on every trip. His latest published find is based on his travel to the Wrangells in 2008 with Thomas Adams of San Antonio College, Yoshitsugu Kobayashi of Hokkaido University and Linda Stromquist of the National Park Service. Fiorillo had read about prehistoric plant fossils that others found in a streambed near Chisana. That type of vegetation in other places sometimes leads to dinosaur fossils. 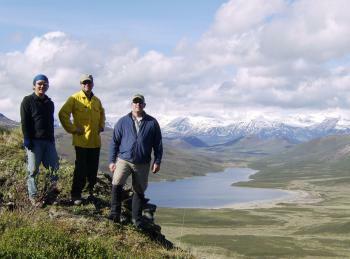 From left, Yoshi Kobayashi, Tony Fiorillo and Tom Adams in the Wrangell Mountains near where they discovered dinosaur tracks. Photo courtesy Tony Fiorillo. Not long into the fieldwork, Fiorillo picked up a plate-size rock and held it up in the sunshine. He could see the impression of the middle toe of a three-toed dinosaur; by squinting at the rock as he turned it, he could make out a print pressed into the ground by a hefty creature that stomped past 70 million years ago. Close by, he recognized another print, the track of a smaller, zippy meat-eater. He called over his colleagues one by one and didn’t tell them a thing. Instead, he asked them what they saw. One spotted the plant-eater track right away; the other pointed out the meat-eater’s print. The moment marked the first official records of dinosaurs in Wrangell St. Elias National Park. With these finds, and more to be announced once the publishing cycle catches up with Fiorillo’s recent discoveries, Alaska in the time of the dinosaurs is coming into focus. Soon, Fiorillo will flee the blistering heat of Dallas for the breezy ridgelines of Alaska. This summer, he returns to both Denali National Park and a bend of the Colville River rich with the hardened remains of dinosaurs. Up north, he’ll search for clues as to how dinosaurs could have survived the darkness of winter, even though Alaska was as warm as Washington state millions of years ago. In Denali, he’ll continue exploring a rich area he started on last year, and try to flesh out a “completely bizarre” dinosaur he believes existed there. Ned Rozell is a science writer for the Geophysical Institute. He has been a freelance writer for the Fairbanks Daily News-Miner, the Anchorage Daily News, Mushing magazine, The Kenai Peninsula Clarion and others. In addition to his writing skills, Ned has experience in the great outdoors. During the summers of 1993 and 1994 he was a back country ranger for the National park Service in the Yukon-Charley Rivers National Preserve, a 100-mile buffer zone around the Yukon and Charley Rivers between Eagle and Circle, Alaska. He has worked for the State of Alaska as a wildlands firefighter. After the Exxon Valdez oil spill, he worked for Veco as an oil recovery technician. Ned earned a B.A. in journalism from the University of Alaska Fairbanks in 1990.